GOPIPARANADHANA DASA joined ISKCON soon after graduating from Columbia University in 1972 with a B. A. in linguistics. Now a member of the Bhaktivedanta Book Trust Sanskrit department, he is continuing his translation of Bhaktivinoda Thakura's Sri Caitanya Siksamrta by the request of his spiritual master, His Divine Grace A.C. Bhaktivedanta Swami Prabhupada. 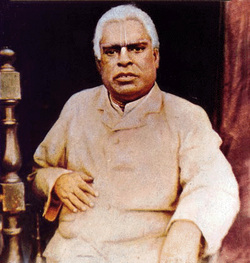 Thakura Bhaktivinoda's special interest was pioneering the distribution of Krsna consciousness to the English-speaking world. He dedicated much of his life to this effort, writing and speaking extensively in English and encouraging other devotees to do the same. His mission has been continued and greatly expanded by his son, Srila Bhaktisiddhanta Sarasvati, and by Srila Bhaktisiddhanta Sarasvati's disciple, His Divine Grace A.C. Bhaktivedanta Swami Prabhupada. Published in 1886, Sri Caitanya-siksamrta (The Nectarean Teachings of Sri Caitanya) was written in straightforward Bengali so that a general audience of devotees and interested laymen could readily appreciate its message. The book systematically and uncompromisingly establishes the basic principles of devotional research, carefully defeating the unsound philosophical positions of sentimental spiritualists, sectarian fanatics, and exploitative scientists. Its subject matter is based largely on the conversations between Sri Caitanya Mahaprabhu and Rupa and Sanatana Gosvamis, which are contained in Srila Krsnadasa Kaviraja's classic biography, Caitanya-caritamrta. 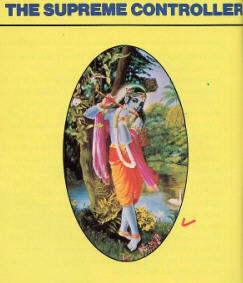 Caitanya-siksamrta, presented by the author as "a flood of nectar," is divided into eight sections called "Rainfalls." Each Rainfall is further subdivided into several "Downpours." The present article is taken from the first Downpour of the first Rainfall. Having reached an end, in Krsna's devotional service, to all theories born out of inconclusive and argumentative illusion, and offering my obeisances to the giver of that devotion, Lord Caitanya Mahaprabhu, I am now undertaking the compilation of this book, entitled Sri Caitanya-siksamrta. The supreme controller is by His own nature complete and purely conscious. He creates everything, living and nonliving, and He is everyone's protector and regulator. By His desire our benefit can arise, and by His desire our complete failure can occur. In His identity as the Supreme Lord, He dominates over the spiritual universe, Vaikuntha, which is eternal and free from anxiety. He is the ruler of all rulers, and thus all activities in every world are going on according to His desire. Whereas an object of the material world assumes some gross form, the Supreme Lord is without any such form. For this reason, the Vedas describe Him as "formless", meaning that we cannot perceive Him with our gross senses. But all things have some innate form, and the Lord is no exception. As the supremely conscious living entity, He has a living, conscious form, as opposed to the unconscious form of dead matter. We too are conscious living entities, but we experience our consciousness through gross material bodies. Thus our naturally conscious identities have become hidden within material identifications. The Lord, on the other hand, is a purely conscious being, and therefore His natural, vital form, full of consciousness, is His complete identity. We can see His form, however, only with fully conscious vision steeped in devotion. We cannot see God with material eyes. We should not consider the Lord's abode, Vaikuntha, to be a material place. Madras, Bombay, Kashmir, Calcutta, London, Paris these are all gross material places. To go to them we must transport our gross body across various material countries and provinces by foot, rail, or ship. Vaikuntha, however, is not this type of region. Eternal, full of life, and faultless, Vaikuntha has a special location beyond all the material worlds. It cannot be seen by the eyes or contemplated with the mind. The only way we can go to this inconceivable abode is to satisfy the Supreme Lord, who is manifested there. At that time we will be able to engage in the service of the Supreme Lord eternally. In this material world, happiness is temporary. It is soon lost. In addition, everything here is full of misery: taking birth involves much hardship and distress, and after birth one must care for his body by eating, sleeping, and so forth. Any interference with these functions, beginning with eating, causes great difficulty. 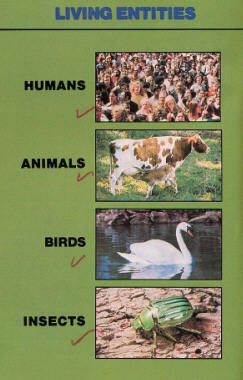 Disease is always a danger, along with such miseries as cold and heat. To mitigate these distresses, one must earn money and accept many bodily inconveniences, such as constructing and maintaining a home. After a few years of marriage and raising children, one eventually grows old and loses his good intelligence. During the course of all these developments, one may arrive at some concocted conceptions of life by discussion and argument with other people. In conclusion, the cycle of birth and death is certainly not an experience of unmixed happiness. People in general think of the temporary cessation of pain as "happiness," but real happiness means to escape from this distressful cycle of material life. If we could attain Vaikuntha, the abode of the Supreme Lord, we would no longer be compelled to endure temporary happiness and distress. Rather we could obtain uninterrupted, eternal bliss. Therefore our ambition should be to satisfy the Lord and be promoted to His eternal abode. As soon as a person awakens to his real self-interest, which is devotional service to the Lord, he should begin practicing it. Thinking, "Now we can enjoy pleasure in the material world, and later, when we grow old, we will work for the satisfaction of the Lord," is a fruitless attitude. Time is very valuable. From the very day one knows what is to be done, he must make the effort to do it. The human form of life is especially rare, and no one can say when death will occur. Therefore, even children should be taught how to practice devotional service to God. The Vedic histories tell of the great devotees Dhruva and Prahlada, who achieved the mercy of the Lord at an extremely young age. If they were capable of performing devotional service in childhood, why should we doubt that any child can? Actually, anyone who practices serving the Lord from early childhood is sure to gradually reach his natural spiritual position. Worshipers engaged in serving God out of fear, hope, or a sense of duty are not as pure as those who serve Him spontaneously. The actual devotees are those who serve the Supreme Lord in raga-marga, the path of spontaneous worship. Only after spontaneous attraction has developed can one enter into the intimacy of the deep relationship existing between the living entity and the Lord. This relationship is eternal, but for the living entity bound to material nature, it remains hidden unless he finds the right process to uncover it. Just as fire can be manifested by rubbing a flint stone, so one's relationship with God can be revealed by following one of the various paths of devotional service. For many people, their spiritual relationship is manifested by constant worship motivated by fear, hope, or obligation. For example, first Dhruva Maharaja worshiped Lord Visnu in the hope of attaining a kingdom. But in the course of his devotional practice, he developed spontaneous attraction in knowledge of his pure relationship with the Lord and rejected any material benediction for sense gratification. Material fear and hope are extremely contemptible. Thus, when a practicing devotee's intelligence becomes strong, he abandons fear and hope, and his sense of duty becomes his only impetus for service. Until spontaneous attraction for the Supreme Lord develops, he maintains this sense of duty, which encompasses two broad categories: observance of the various functions of devotional service and avoidance of what is against the regulative principles of devotional service. He carefully follows the methods of realizing God consciousness that were determined with careful consideration by great authorities in the distant past and then recorded in books. This is known as vidhi-marga, the path of regulated devotional service. By becoming regulated by the concept of duty, the devotee develops respect for the authority of the revealed scriptures and for the regulations of devotional service in practice. 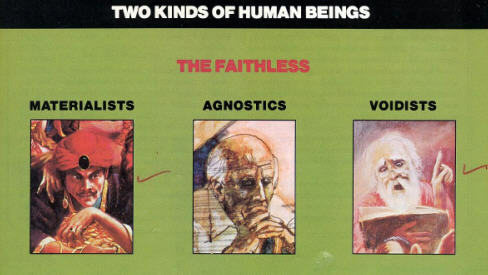 Whether he be totally uncivilized or well suited for developing faith in the Supreme Lord, a human being can have his progress suspended and his life made wretched by the three atheistic diseases of materialism, agnosticism, and voidism. Although not everyone is attacked by these diseases, some do fall prey to them and become attached to their own situations, thus remaining unqualified to reach any higher position in life. On the other hand, even uncultured forest dwellers, by virtue of becoming civilized and expert in morality and education, and then further adopting the social and spiritual organization of the Vedic varnasrama-dharma, can very quickly come to the platform of devotees qualified to engage in the service of the Supreme Lord. This is the natural course of a human being's spiritual growth. But if obstructions in the form of spiritual disease arise, one's way of life becomes perverted. Although human nature is the same everywhere, people living in different nations and on different continents acquire different secondary characteristics. It is impossible to find two people living in the world who have exactly the same secondary nature. Even two brothers born from the same womb will differ in appearance and personality, what to speak of people born in separate countries. In different regions, things such as the locations of bodies of water, air currents, mountains and forests, and the availability of foodstuffs and clothing all vary. Consequently, differences naturally occur in people's appearance, social status, occupation, and style of dressing and eating. Each nationality has a peculiar disposition of mind, and thus various conceptions of the Supreme Lord, although the same in essence, appear superficially dissimilar. As people in different places rise above their aboriginal condition and gradually develop culture, science, law, and devotion to God, their means of worship also diverge in terms of language, costume, kinds of offerings, and mental attitudes. Considering all these secondary differences impartially, however, we find no discrepancy. As long as the object of worship is the same, there is no harm. Therefore Lord Caitanya has specifically ordered that we should execute our own service to the Supreme Lord in the mode of pure goodness and at the same time refrain from ridiculing the religious codes of others. Because of the variety of spiritual authorities, in some places people honor the Vedic sages, in others they revere the prophets led by Muhammed, and in still other regions they esteem the religious personalities who follow Jesus. Similarly, in each locality many different men of knowledge are shown particular respect. Each community should, of course, properly honor its own spiritual masters, but simply for the sake of gaining followers, no one should try to establish that the instructions given by one's own local spiritual master are better than the instructions of spiritual masters everywhere else. The propagation of such an antagonistic position would certainly be inauspicious for the world. A devotee's prescribed ritual of worship varies according to his mentality and devotional feeling. In some places the mode of worship is to seat oneself in a sacred place and practice renunciation and breath control. In another place worship is performed by falling down five times during the day and evening even if caught unprepared to offer obeisances facing the direction of the chief shrine. And elsewhere worshipers kneel down, either in the temple or at home, and with folded hands declare their own fallen condition and the glories of the Lord. Each of these types of worship also differs in the matter of what to wear, whether and how to eat, what is clean or unclean, and so forth. Furthermore, the sentiment and behavior toward the worshipable object vary among religions. Some worshipers, whose consciousness is saturated with devotion, set up a Deity of the Supreme Lord in their heart, in their mind, or in the outside world, with the understanding that it is non-different from the Lord. In other processes, which are inclined more toward logical argument, a conception of the Lord is formed within the mind and worshiped; external images are not accepted. Actually, however, all of these Deities are factual representations. The many religions of the world have naturally grown very distinct from each other due to these five kinds of differences. However, to create mutual discord because of these differences would be disastrous. If one happens to be in another's temple at the time of his worship, one should think, "Here my Lord is being worshiped in a different form. Since I am committed to my particular practice, I cannot take part in this ritual, but as I watch it, I am developing a greater feeling for my own method of worship. The Supreme Absolute Truth is one without a second. Therefore, as I offer my obeisances to the form which I see here, I pray to my Lord, from whom this form comes, that this Deity will help me expand my love for Him."